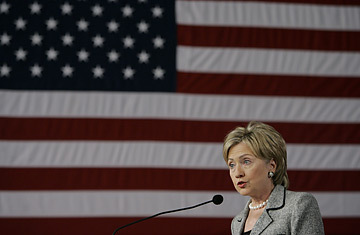 Democratic presidential hopeful Sen. Hillary Rodham Clinton speaks about her health care policy. Whenever the subject of health care reform comes up on the campaign trail, Hillary Clinton unfailingly offers a joke about how she tried that once before, and has the scars to prove it. The ambitious proposal that she put forward on Monday also shows that she learned a few things as well. The $110-billion-a-year plan avoids some of the biggest political landmines of that 1993-1994 effort. Instead of forcing people into big buying cooperatives  back then, she called them "alliances"  her new proposal allows people who like their health insurance to keep it. Her earlier plan would have established a big new government bureaucracy to determine things like what specific benefits should be required for all Americans; her new one does not. And while it contains a version of her earlier plan's controversial "employer mandate," requiring businesses to provide coverage for their workers, it exempts small employers. That means the revised employer mandate in her new plan would miss a large segment of the uninsured population; currently, the Clinton campaign acknowledged, only 48% of companies that employ fewer than 10 people provide health benefits. Instead, Clinton's new plan achieves universal coverage by imposing an "individual mandate"  a requirement that those who do not get coverage from their employers go out and purchase it themselves  but also by offering tax breaks and other incentives to make that affordable. It would be financed in part by eliminating President Bush's tax cuts for wealthier Americans. In almost all of those respects, Clinton's plan is similar to those put forward earlier by her two chief rivals for the Democratic nomination, John Edwards and Barack Obama. (One difference: Obama's proposal does not include an individual mandate, and therefore, does not reach true universal coverage). The leading Democratic contenders also include provisions that would allow people to buy into a government-run plan, similar to Medicare, which would amount to a test of both the support and feasibility of a "single-payer" system similar to Canadian and European systems. Though the Democratic candidates will certainly argue over the fine print of their various proposals in coming months, those differences are not likely to mean much to average voters. The real battle will be convincing Democratic primary voters which candidate can actually turn his or her plan into reality. In that regard, Clinton's health care speech contained a thinly veiled dig at her competition, and particularly Obama, who has been touting himself as the candidate of change. "Change is just a word," she said, "unless you have the strength and experience to make it happen." Returning the fire, Clinton's opponents aimed their own criticisms less at any aspect of her message than at the messenger herself. Obama suggested, without naming her, that Clinton would be too divisive a figure to achieve such a difficult political feat: "The real key to passing any health care reform is the ability to bring people together in an open, transparent process that builds a broad consensus for change." Senator Chris Dodd was blunter: "While she talks about the political scars she bears, the personal scars borne by the American people are far greater. The mismanagement of the effort in 1993 and 1994 has set back our ability to move toward universal health care immeasurably." For more than a decade after the failure of that disastrous attempt  which nearly ran Bill Clinton's presidency aground in his first term, and saw people literally burning his wife in effigy  politicians of both parties were gun-shy about approaching the health care issue. But the problem itself continued to grow. Nearly 50 million people now lack health coverage, compared with around 36 million in 1993. And costs have risen dramatically: Figures released last week by the Kaiser Family Foundation showed premium costs have risen 78% in the last six years, to an annual cost of $12,106 per family. As costs have risen, businesses  which were aligned against the Clinton plan in 1994  have joined the call for a major reform effort. In this presidential season, Democratic candidates are not the only ones putting forward health reform plans. However, the Republican proposals thus far do not claim to provide coverage for everyone. Instead, they have relied on tax incentives that would encourage businesses and consumers to buy health coverage themselves from private insurers. Ironically, although the Clinton plan looks very much like the one that Mitt Romney signed into law for Massachusetts when he was Governor of that state, the Republican candidate blasted it Monday as "bad medicine." As a presidential contender, he has distanced himself from the Massachusetts program, which is proving costlier and more difficult to implement than advertised. He also says that what works for an individual state may not work nationally. "A one-size-fits-all national health care system is bound to fail," Romney said in introducing his plan last month.